Library closed on Thurs, 2/21/19. 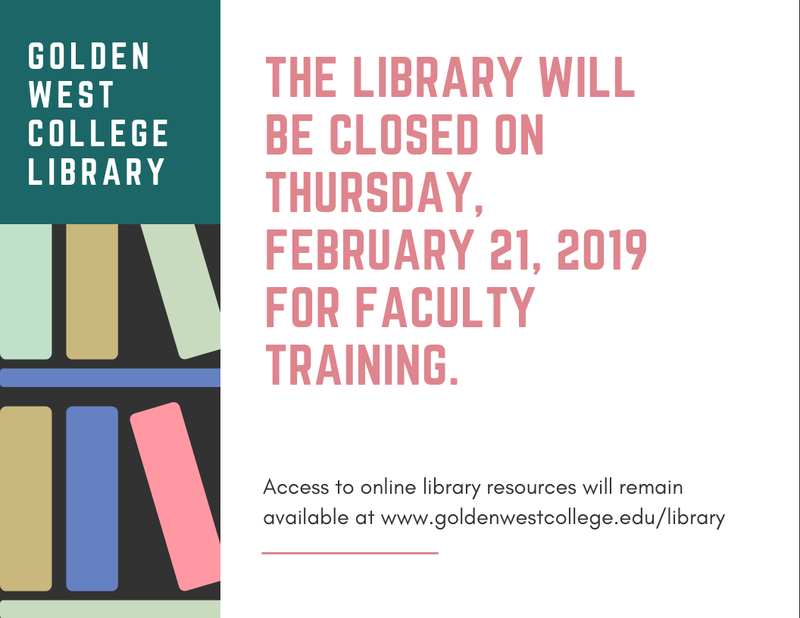 The library will be closed on Thursday, February 21st, 2019, for faculty training. Access to online library resources will remain available at www.goldenwestcollege.edu/library. 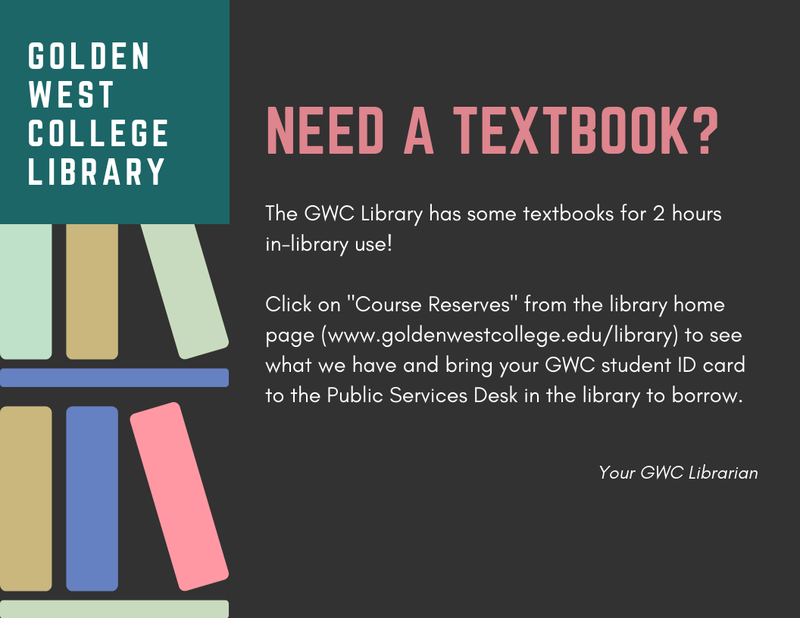 Click on "Course Reserves" from the library home page (www.goldenwestcollege.edu/library) to see what we have and bring your GWC student ID card to the Public Services Desk in the library to borrow. 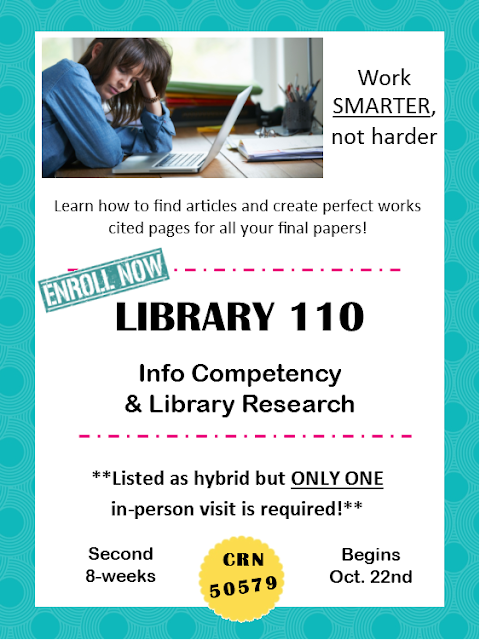 Enroll now for Library 110 Info Competency & Library Research. Work SMARTER, not harder. 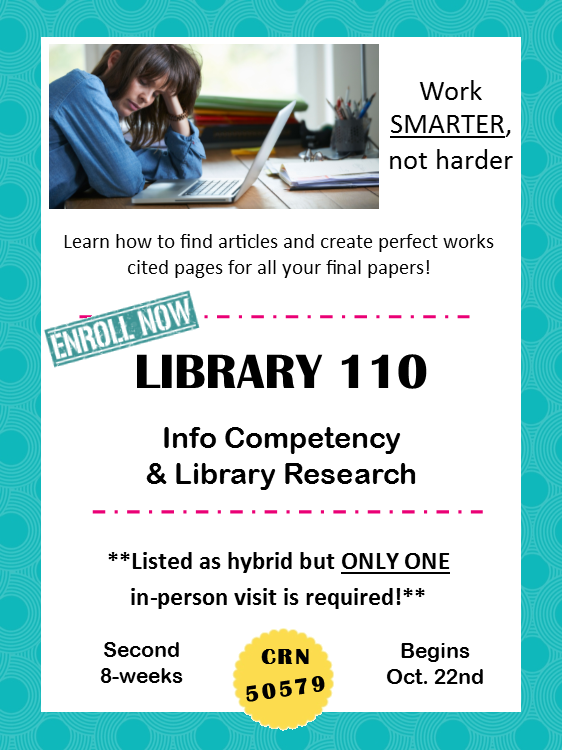 Learn how to find articles and create perfect works cited pages for all your final papers! Listed as hybrid but ONLY ONE in-person visit is required! 2nd 8 weeks course. 1 unit. Begins October 22nd, 2018. CRN 50579. 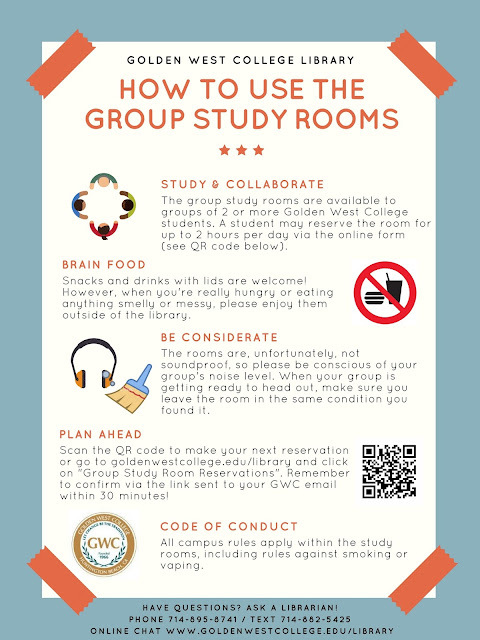 Study & Collaborate - The group study rooms are available to groups of 2 or more Golden West College students. 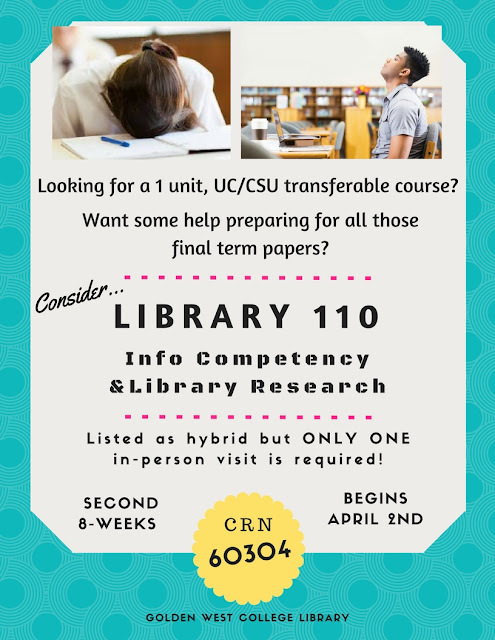 A student may reserve the room for up to 2 hours per day via the online form (see QR code below). Brain Food - Snacks and drinks with lids are welcome! However, when you're really hungry or eating anything smelly or messy, please enjoy them outside of the library. Be Considerate - The rooms are, unfortunately, not soundproof, so please be conscious of your group's noise level. When your group is getting ready to head out, make sure you leave the room in the same condition you found it. Plan Ahead - Scan the QR code to make your next reservation or go to goldenwestcollege.edu/library and click on "Group Study Room Reservations". Remember to confirm via the link sent to your GWC email within 30 minutes! Code of Conduct - All campus rules apply within the study rooms, including rules against smoking or vaping. 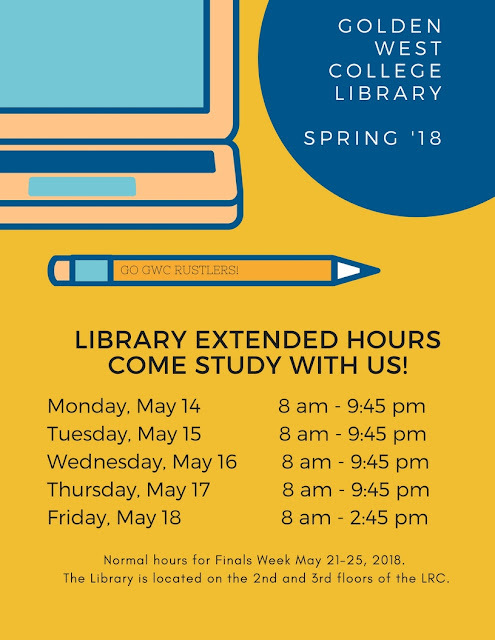 Normal hours for Finals Week May 21-25, 2018. 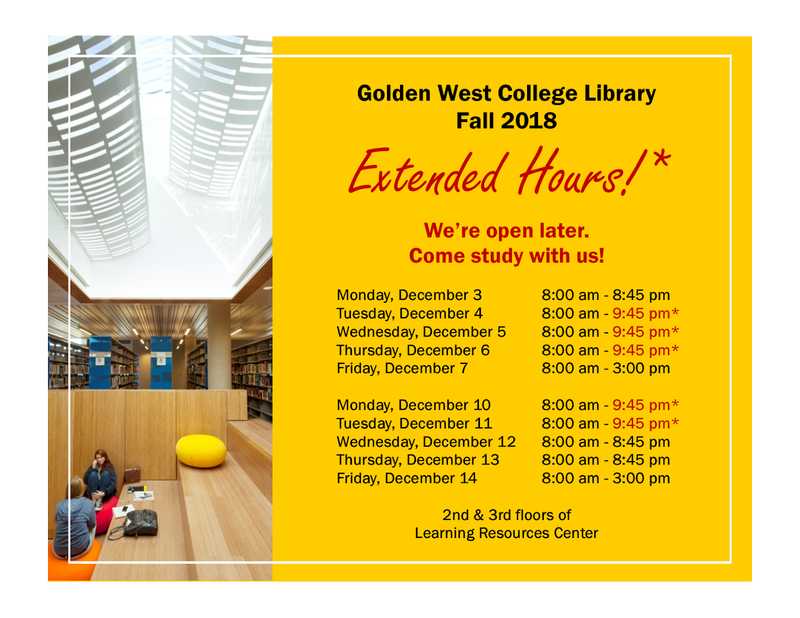 The Library is located on the 2nd and 3rd floors of the LRC. GWC Library will be closed on Thursday, February 15th, 2018 for Faculty Training, as well as Friday, February 16th thru Monday, February 19th, for the holidays. Be sure to bring all relevant tax documents with you. 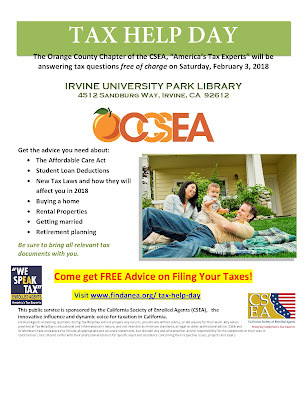 Come get FREE Advice on Filing Your Taxes! This public service is sponsored by the California Society of Enrolled Agents (CSEA), the innovative influence and dynamic voice for taxation in California.Enrolled Agents answering questions during Tax Help Day will not prepare any returns, provide any written advice, or bill anyone for their work. 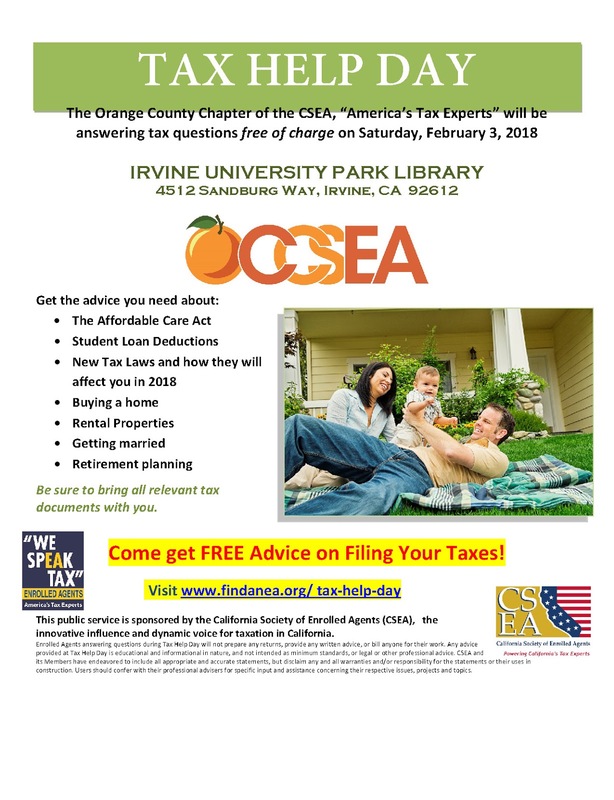 Any advice provided at Tax Help Day is educational and informational in nature, and not intended as minimum standards, or legal or other professional advice. CSEA and its Members have endeavored to include all appropriate and accurate statements, but disclaim any and all warranties and/or responsibility for the statements or their uses in construction. Users should confer with their professional advisers for specific input and assistance concerning their respective issues, projects, and topics. 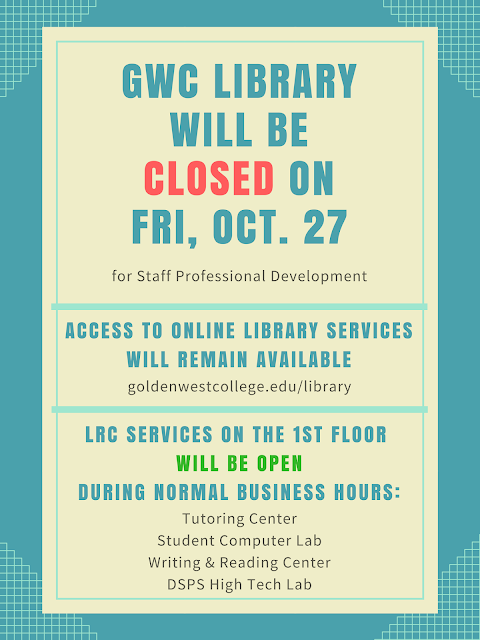 GWC Library will be closed on Friday, October 27th for Staff Professional Development.